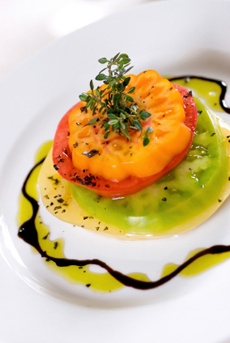 Heirloom tomatoes with basil oil, a balsamic vinegar reduction and black cypress sea salt flakes. For a reduction, you’d use a good Industriale balsamic, as you’ll read in the discussion of the “Leaf” system, below, Photo by Kelly Cline | IST. The sections highlighted in red are on this page. Click on the black links to go to other pages for the first and third parts of this article. Today, commercial production of authentic balsamic vinegar is governed by a consortium or producers, Consorzio Produttori Aceto Balsamico di Modena (Consortium of Producers of Balsamic Vinegar of Modena). The Consorzio ensures the strictest controls by supervising every aspect of the production, from the harvesting of the grapes to the packaging and labeling of the bottles. Even the shape of the bottle is mandated! True aceto balsamico has an Italian government designation of D.O.C. (Denominazione di Origine Controllata, similar to the French A.O.C. designation), which means that everything from the grape varietals to aging time and the type of wood of the barrels adheres to exact standards. The grapes must be of the Trebbiano and Lambrusco varietals (though a few others are allowed in small quantities), and entirely harvested from the vineyards of the region. The vinegar must be aged in barrels of at least five types of specified wood. The vinegar must be aged for minimum of 12 years. No wonder authentic balsamic is so costly—and tastes so good! In 2000, the European Union bestowed the D.O.P. status (Denominazione di Origine Protetta) status upon Aceto Balsamico di Modena. This means that not just that the ingredients must come from the specified geographical area, but that all phases of production must take place in the area. If you’re in Modena, plan a visit to the Consorzio: Consorzio Produttori Aceto Balsamico Tradizionale di Modena, Corso Cavour 60. Telephone: 059-242298, Fax: 059-242565 (www.Balsamico.it). There are other balsamic consorzios. 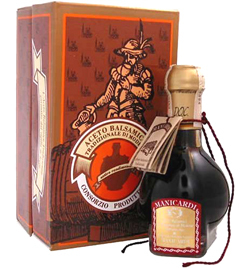 In 2000, Giovanni Leonardi and other producers of fine condimento balsamicos established the Consorzio di Balsamico Condimento to distinguish the top-quality condimentos from those of lesser quality. A ring on the neck of the bottle, like the one in the photo at the right, assures buyers of the quality product. 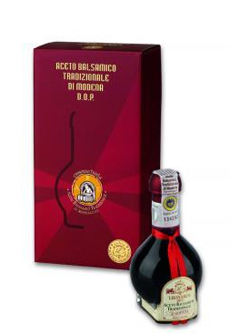 In 1993, seventeen producers established another own consorzio to provide authenticity to products from Modena: Il Consorzio Aceto Balsamico di Modena, the CABM. Their products are designated with the logo at the right. The logo can be applied to any industriale balsamic from the Modena area and simply means that the product comes from the region. Aside from the seals of the tradizionale and condimento Consorzios, you would do better to use the AIB four-leaf ranking (see below) to guide your purchases. 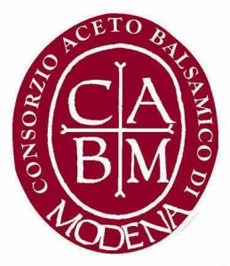 The seal of the Consorzio Aceto Balsamico di Modena, the Balsamic Vinegar Consortium of Modena. Analogous to wine, you don’t make salad dressing with the $500 bottle. Each classification of balsamic has its purpose. THE BEST: Aceto Balsamico Tradizionale. The best and rarest: Only about 3,000 gallons are produced each year, carefully tracked by producer by the Consorzio. With its rich flavor and sweet and balance, there is acidity but no acidic taste. The flavor should be the perfect blend of sweet and tart. The color is brown-black and when the bottle is tipped, the vinegar should leave a slick on the side of the glass. The unique taste of this wonderful product helps to allay the sticker shock. You can pay $70 to $500 and more for a bottle, depending on the age (12 years to 120 years; 20 to 30 years is common), the rating by the judges of the Consorzio (red, silver or gold label), the price set by the producer and the varying distributor and retailer mark-ups (we found a 3.38-ounce bottle of Acetaia Leonardi “Il Patriarca” Gold Reserve, which is 100 years old, selling for $499, $595 and $640). As with the finest olive oils, tradizionale (trah-DEE-tsee-oh-NAH-lay) balsamics are not for cooking: Aside from the expense, the nuances of flavor will evaporate when exposed to cooking heat. Also as with fine oils, balsamics should be kept in a cool, dark place. The Consorzio-mandated bottle shape for a tradizionale balsamico. Photo courtesy Acetaia Leonardi. To be sure you are purchasing an authentic balsamic, look for the code API MO, which indicates the vinegar was made in Modena, or API RE, which indicates the Reggio Emilia province. 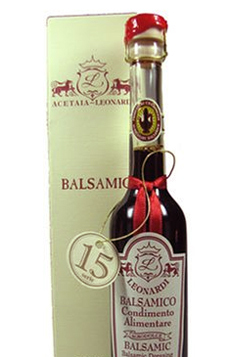 A balsamic at least 12 years old is a tradizionale vecchio (old) and at 25 years they are called tradizionale extra vecchio (extra-old) or il patriarca (patriarch). It can be extremely confusing to tell the difference between a tradizionale and a condimento or any other balsamic with an authentic-looking red wax seal. The easiest thing to do is to memorize this onion-shaped bottle at the right, authorized by the Consorzio and used exclusively by tradizionales. Note that it also has a foil cap, in this case, gold, and the consorzio numbered seal across that. There is no red wax seal. If you see any other shape, it may be a condimento that’s 25 or 50 years old, but it’s not a tradizionale. See more about how to verify a condimento in the next section. These fine balsamics are made by almost identical traditional methods but are lacking one variable to be tradizionale balsamics—e.g., they do not use all five prescribed woods, but a minimum of three. Or, the producer wants to release the vinegar earlier than the mandated 12 years. Or, the producer may be outside of Modena and Reggio Emilia. They are also called salsa balsamica (balsamic sauce) and salsa di mosto cotto (cooked must). These high-quality vinegars are costly but still much less expensive than tradizionales—$40 versus $80 for eight ounces of 12-year-old balsamic, for example. They utilize the same traditional methods of production and careful aging that have been carried on by Modenese families for centuries, aging vinegar for 10 to 15 years in wood barrels. Unlike the bottle shape above, which is a requirement for tradizionale balsamics, a condimento can be in any shape bottle. Photo courtesy Del Borgo. Condimentos made by members of the Consorzio di Balsamico Condimento have the official seal around the neck of the bottle. These condimentos are guaranteed to be aged in wood and made of all natural ingredients. Producers are free to create vinegar in the style and flavor profile they wish. Condimentos are not constrained by bottle shape—you can tell a condimento readily by the more modern shape of the bottle. Condimentos taste almost as good—and for the money, are a better value to drizzle on steaks, chops and Parmesan. You can find condimentos that are aged 25 and 50 years. However, as with tradizionales, some producers are better than others. Ask your vinegar purveyor for a recommendation. This is tougher than identifying a tradizionale balsamic, which has a unique bottle shape). There’s a real challenge to identifying a condimento—a quality balsamic—from an industriale, or commercial-quality product. 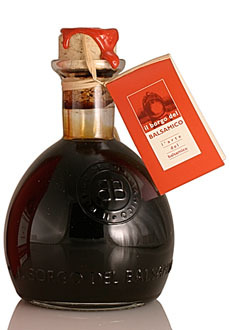 Both can have a red wax seal and use the word “aged balsamic from Modena.” Both can use a number, e.g. 6 Year Old. And, some industriales can be priced at the same level as consorzios. An industriale is also called “Aceto Balsamico di Modena” (balsamic vinegar of Moena), which sounds like the real deal. So look at the ingredients. A condimento is made only from grape must. An industriale has must but will also list other ingredients. Grape must mixed with red wine vinegar is the finest factory vinegar. If the label includes sugar and caramel coloring, it’s the cheapest (but what did you expect for $6.00?). Look for the words Consorzio di Balsamico Condimento, or at least remember the word “consorzio.” This is the consortium that watches over condimento balsamics. 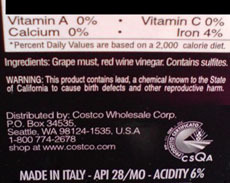 lThis label from a bottle of Costco balsamic vinegar includes red wine: a sign that it’s a factory/industriale balsamic, not a consorzio vinegar. “Industriale” Balsamic. Commercial balsamic vinegars from the region are quick-process: Either the grape must is caramelized (cooked until it changes color) or caramelized sugar is added (and sometimes flavorings). Then, it is aged in large vats with wood chips for flavor. Industriales are a generally blend of cooked grape must and red wine vinegar and are labeled “Aceto Balsamico di Modena” (you will never see the word “industriale”). This is “imitation tradizionale.” According to Italian law, for a vinegar to be labeled as authentic balsamic, it must be aged at least three years, but there is no guarantee that it is aged in wood. Some can have be colored with caramel to make them look like “real” balsamic, which many further emulate with red wax seals and claims of “aged” (including the further-confusing “aged 6 years,” which can be a far-superior condimento). Industriales are more acidic than artisan-made balsamics, but the better ones can be very satisfying. Quality and price vary widely, and it can be very confusing to look at a shelf with bottles that cost $5, $10, $15, $20 and $25. Price is not always an indication of quality, and unlike the wine business, there aren’t reviewers who wax poetic on different bottlings. To end the buyer confusion, a few years ago an independent group, AIB (an acronym translating to the Association of Italian Balsamic Tasters), developed a scale ranking industriale balsamics [not tradizionales or condimentos] on a scale of 0 to 4, based on sensory evaluation. Grape leaves are used to indicate rank—essentially, a higher ratio of grape must to red wine yields a higher rank. In addition, there is Imitation Balsamic, and this includes much of what is sold in the U.S. It is generally cider vinegar, colored and flavored to look like balsamic. Look at the label: You will see that these are the ingredients. Look at the price: If 8 ounces are selling for $5.00 or less, it cannot possibly be authentic balsamic vinegar. A “0 leaf” balsamic might be 95% red wine vinegar with a small amount of cooked grape must, and some caramel coloring to give it a dark color. This is inexpensive “supermarket quality.” If you like fine food, you deserve a better vinegar. A “1 leaf” balsamic is considered the right quality for a vinaigrette or as a dip for crudités. Drizzle on baked potatoes instead of using butter or sour cream (not only delicious, but low calorie), sprinkle on steamed vegetables, use in stir-frys instead of soy sauce, use instead of salt over poultry or meat. Try it in gazpacho. A 1-leaf is popular for enlivening soups, stews and sauces. So that the heat does not evaporate its flavor, the balsamic should be added to dishes at the end of cooking. With a “2 leaf” balsamic, the sweetness of the traditional balsamic begins to overpower the tartness of the cider vinegar. It may be too sweet for a those who prefer a tart vinaigrette, but is excellent in marinades or drizzled over finished dishes. Use it in cooking, in dishes like veal scallopini. The rule of thumb is one teaspoon per serving. Remember: Don’t cook vinegar in aluminum pots—the acid reacts with aluminum. A “3 leaf” balsamic is even sweeter, and twice the price of a “2 leaf.” Its richness makes it a perfect condiment for fish, lamb or beef, drizzled straight from the bottle, or added to the saucepan to give extra body and character to sauces and gravies. Use it with the popular Caprese salad: fresh tomatoes, mozzarella and basil (or choose “2-leaf” if you prefer a more tart vinegar). A “4 leaf” balsamic is syrupy-sweet, with only a hint of acid. It is used as a dessert topping, drizzled over strawberries or raspberries (with a pinch of sugar if the fruit needs it), ice cream or cake. Or, drizzle it over chunks of Parmesan cheese as a dessert, which is what people do with the fabulous Tradizionale and Condimento balsamics. As you can see, the leaf system is of great help when facing a wall of balsamics at the market. Unfortunately, use of it is optional, and for brands sold in America, it is the exception rather than the rule. The largest sales are in imitation balsamic. While authentic balsamics are all natural, if you are allergic to sulfites, be sure to check the label before purchasing. Imitation Balsamic. There are many factory-produced imitation balsamics, imported and domestic, that appear in grocery stores and warehouse stores, priced at less than two dollars to under $10. Most are merely cider vinegar with caramel coloring and artificial flavoring. Although they serve a purpose, they are not real balsamic vinegar; and they approximate the balsamic experience as closely as a gallon of domestic “Chablis” wine approximates a fine Chablis from Burgundy. The higher-priced ones, often in attractive bottles, can confuse buyers because the prices start to overlap with lower-priced industriales. You might not expect a real balsamic vinegar for $2.89, but for $9.99? The best way to tell is to look at the ingredients. A real industrial balsamic is made from grape must and vinegar; imitations are made from vinegar and sugar, no grape must. Faux Balsamic-Artisanal. Some domestic specialty food producers are making their own “balsamics” from quality grapes and barrels, although not five mandated woods of the consorzio; and they often have shorter aging periods—3 or 6 years. Yet, if they are made with artisan techniques and uphold traditional methods and standards of quality, they are better than an Italian industriale if not quite a consorzio. As this category counts for a very minor amount of production, if you find these artisan vinegars, try them and see how you like them. Read the labels carefully: Be sure you see grape must and an indication of age, or don’t pay a premium. Each tradizionale is judged blind by a Consorzio panel and then rated gold, silver or red label, with gold having the highest number of points. So, you can buy a tradizionale, but there are three levels of quality (and this impacts the price). Instead of just putting the age in years on the bottle, producers of tradizionale are entitled to use a corresponding word. Thus, a 12-year balsamic can also carry the Consorzio designation “Vecchio” (old) or “Affinato” (sharp); a 25 year earns the designation “Extravecchio,” “Extra Vecchio” or “Stravecchio” (extra-old), and is also called Il Patriarcho (the patriarch) by some producers. If you do not see the words, it doesn’t mean that the bottle is lesser quality than a bottle that does contain them. It’s marketing! The vinegar may be older than the 25 years but the Consorzio only recognizes these two categories because that is all they feel they can guarantee. However, producers may bestow unique proprietary names. For example, Il Patriarco and Il Patriarco Reserve are the names for Leonardi’s 50- and 100-year tradizionales. Similarly, some producers have their own marketing terminology, e.g. White Seal, Beige Label. This may indicate something within their own line of vinegars, but means nothing in terms of comparison to other producers’ balsamics. It is just very confusing to the consumer. Gold cap does not mean gold label—a gold cap with the initials D.O.P. just means it’s 25 years old. Twelve-year-old bottles get ivory caps with the D.O.P. Summary: Forget all of the extra names. The only important things to remember when buying a tradizionale are the color of the label (gold, silver or red) and the age. The gold or ivory cap is your first tip-off, but don’t be swayed if one gold-cap bottle says “Extra Vecchio” and the next one doesn’t. To add to the confusion, if you’re trying to compare prices, you may need a calculator. Some products are bottled in Italian sizes, milliliters, which translate into an awkward 3.38 ounces for 100 ml and 8.45 ounces for 250 ml. The former is never rounded up to 3.4, but the latter is generally rounded up to 8.5. The latter, which is 250 ml, is also expressed as 1/4 liter. Other brands are bottled for the American market and the weights are rounded into 3.5-ounce and 8-ounce sizes. To learn more about any of the vinegars, click on the link. Prices are verified as of the publication date of this article, but are subject to change. Now, proceed to the final section of this article and learn how Tradizionale balsamic vinegar is made (and why it justifies these prices). You also learn how to taste and evaluate balsamic vinegar like a professional.